The striking Tam O’ Shanter sea urchin. 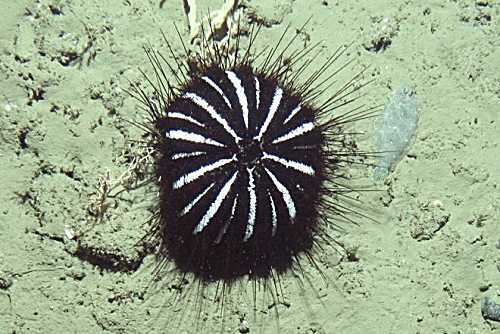 Examples like this were found along with three new species during a deep-sea survey of seamounts on the Chatham Rise in June 2009. NIWA’s research vessel Tangaroa explored the Chatham Rise, an area that stretches for 1000 kilometres from near the South Island eastwards to the Chatham Islands. In the NZ Herald yesterday morning came news that NIWA is “putting all of its temperature data and calculations on the internet”. It’s been five weeks since the NZCSC request to NIWA’s CEO, John Morgan, under the Official Information Act; it’s only two months since we published our study critical of the handling of the NZ temperature record; and it is decades since Dr Vincent Gray, Dr Warwick Hughes, Dr Jim Hessell and others started asking Dr Jim Salinger for his data and calculations.